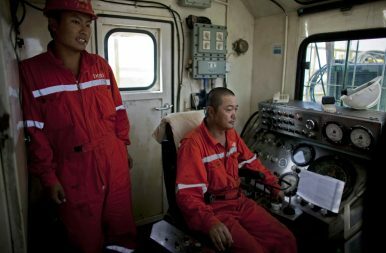 In this Nov. 17, 2010 file photo, Chinese technicians man drilling equipment on an oil rig in Paloich, South Sudan. Few countries would look at South Sudan as an ideal location for a business venture, but China has built much of its reputation as a world power on an economic philosophy of risk-taking. South Sudan also offers a lucrative opportunity for entrepreneurs intrepid enough to take it: the East African country boasts 3.5 billion barrels’ worth of crude oil in proven reserves, and petroleum geologists will likely find more in the two-thirds of South Sudan that they have yet to explore. Despite the challenges of working in a war zone, China dominates what analysts have assessed as the third largest oil reserves in Africa. Much of China’s success in Africa comes from the world power’s tendency to avoid criticizing allies who ignore human rights and international law. This approach to foreign policy underpins the Belt and Road Initiative, a project designed to expand China’s sphere of influence in the Global South. The South Sudan–China Friendship Association, whose board includes former South Sudanese foreign and interior ministers, has promoted the ambitious Chinese endeavor on Twitter. When Sudan and the Sudan People’s Liberation Army, or SPLA, brought an end to the Second Sudanese Civil War with the Comprehensive Peace Agreement in 2005, China realized that the majority of Sudan’s oil reserves fell into what would become South Sudanese territory. As early as 2011 — the year of South Sudanese independence — the China National Petroleum Corporation, or CNPC, established an office in the South Sudanese capital of Juba. While the outbreak of the South Sudanese Civil War in 2013 forced CNPC to evacuate the office, the company was operating there again just one year later. The South Sudanese Civil War has forced China to deal with a variety of economic and military dilemmas. The conflict has halved the extraction of petroleum, hurting CNPC’s bottom line. The fighting also presents a risk to the safety of CNPC employees. Sectarian violence in South Sudan resulted in the deaths of 14 Chinese oil workers in just one day last year. China had hoped to prevent such a scenario by deploying its soldiers to oil fields in 2014, but this move came with its own risks. Two soldiers died in 2016, and Chinese peacekeepers engaged in a standoff with South Sudanese rebels in 2018. South Sudan’s history of political stalemates has further constrained opportunities for China there. The year before the South Sudanese Civil War even began, South Sudan cited a geopolitical conspiracy as its reason for expelling Liu Yingcai, the head of the consortium PetroDar Operating Company. If China’s ambitious gamble in South Sudan succeeds, the world power stands to reap diplomatic and economic benefits. In August 2018, CNPC inked an agreement with the South Sudanese Petroleum and Mining Ministry to conduct hydrocarbon exploration in the heart of the country, outdoing French and Kuwaiti competitors. Given that South Sudan depends on petroleum for 98 percent of its budget, China also enjoys more than enough leverage to bring the East African country into its sphere of influence. The return of peace to South Sudan could yield exceptional profits for its Chinese benefactors. The Chinese willingness to invest in war zones may start paying dividends this year. South Sudanese President Salva Kiir and Riek Machar, leader of the Sudan People’s Liberation Movement in Opposition, signed a peace treaty last July. They have since been coordinating its implementation. CNPC has benefited from the South Sudanese Civil War in that the long-running conflict deterred the state-owned enterprise’s competitors from even thinking of touching the market. Now that the largest faction of South Sudanese rebels is committing itself to reconciliation, CNPC stands to gain even more. Even so, this success depends on the longevity of peace in South Sudan, where other factions continue to rebel against Kiir. Some observers also question the viability of the deal between him and Machar, given that a 2016 agreement only managed to stop the South Sudanese Civil War for a few months. To keep China in South Sudan for good, Kiir and Machar will need to ensure that their militias refrain from the kind of political and sectarian violence that has long wracked their homeland. *Austin Bodetti studies the intersection of Islam, culture, and politics in Africa and Asia. He has conducted fieldwork in Bosnia, Indonesia, Iraq, Myanmar, Nicaragua, Oman, South Sudan, Thailand, and Uganda. His writing has appeared in The Daily Beast, USA Today, Vox, and Wired.